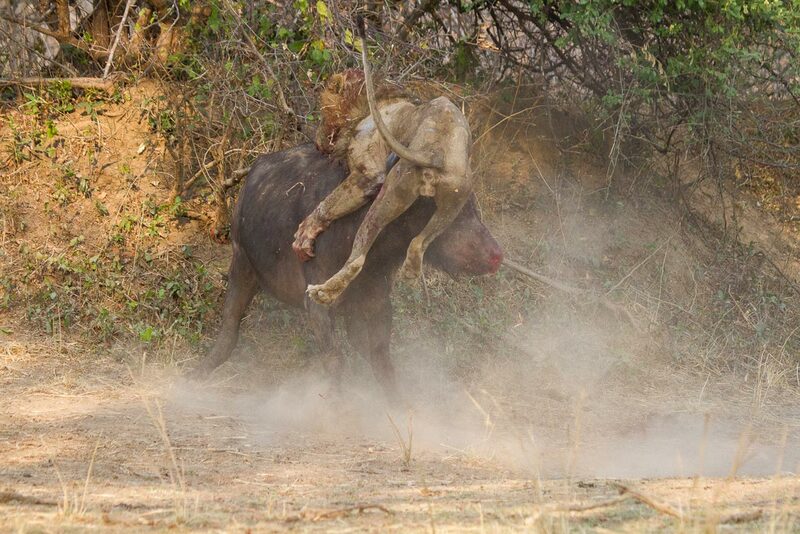 An amateur photographer in Zambia's South Luangwa National Park recently captured an extraordinary faceoff between an old male lion and a female buffalo – and it's one of the most tragically epic and gruesome wildlife battles we've ever seen. Matt Armstrong-Ford works as camp manager and guide for Shenton Safaris, which operates two safari camps in the park. Tracking the area's resident lion prides is part of the job description, so when a radio tip-off alerted him to commotion breaking out at a nearby photographic hide, he was on scene in minutes. 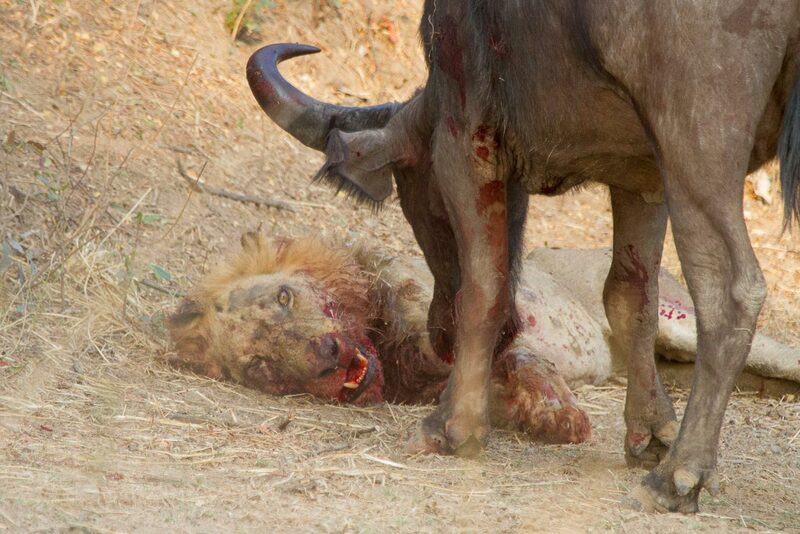 What greeted him was the sight of a bloodied male lion with his claws hooked into the muzzle of a buffalo. "What followed can only be described as an epic battle between two gladiators fighting to the death. The battle took place in the same way you would see two heavyweight boxers fighting for the world title. After three-minute bouts, both titans would stand and stare at each other waiting for the other to make the first move," Armstrong-Ford recalls. The big cat was a familiar one. The dominant male of a resident pride, the lion had been looking worse for wear in recent weeks, losing weight and possibly suffering from a skin condition. He had separated himself from the rest of the pride weeks before. 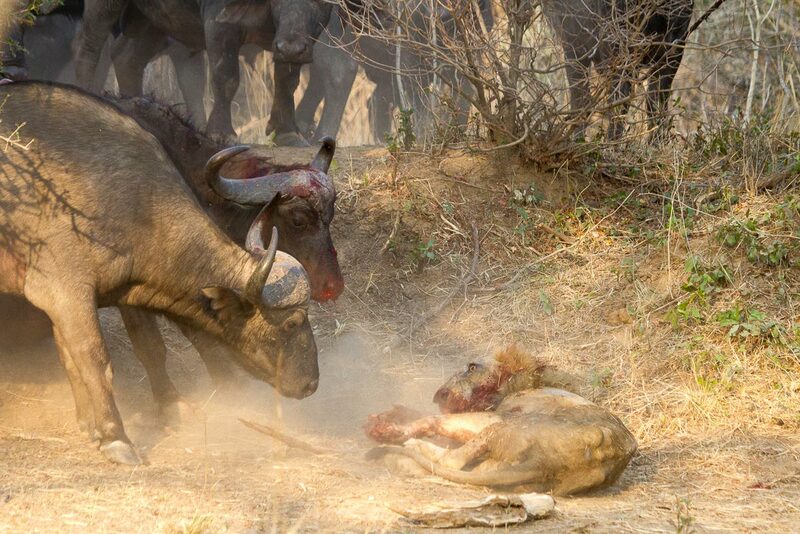 In this weakened state, the buffalo proved to be an unbeatable opponent. "After each interval you could see both fighters getting weaker and weaker and by round seven both were finished. 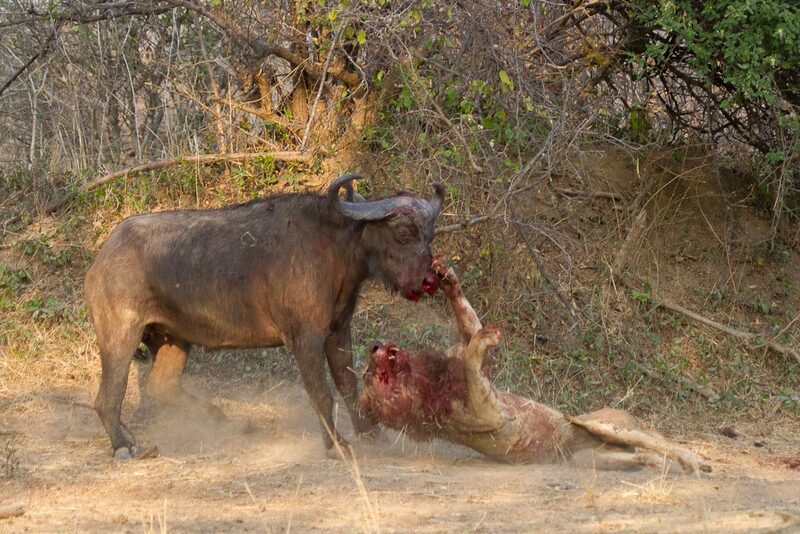 It was at that point where the herd came to the rescue and a male buffalo, much like a referee, came and put an end to the fight," Armstrong-Ford writes. Wounded and exhausted after losing the battle, the lion managed to drag himself under a nearby bush to recover. It seemed initially that he would survive the ferocious encounter when he was seen after another (this time successful) hunt the following morning. But sadly, this was not to be. 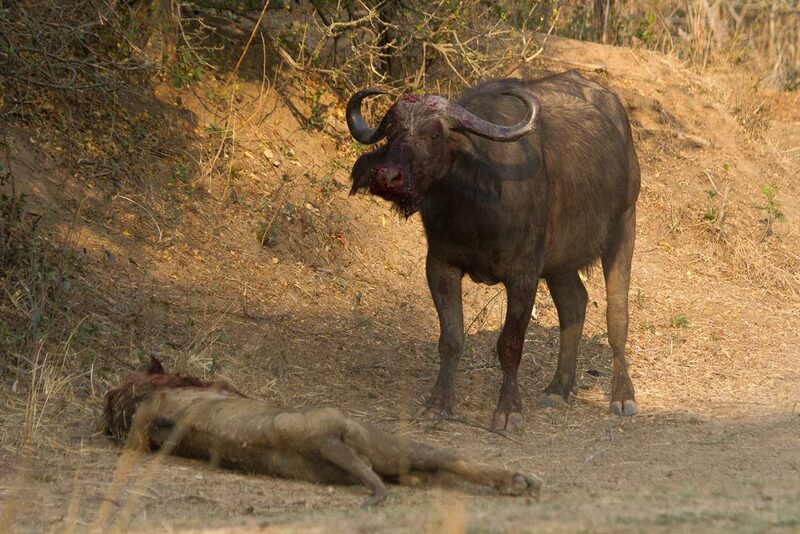 He was found dead just a short while later, most likely as a result of internal injuries inflicted by the buffalo. Just a pair of striped hyenas in the throes of a territorial battle. 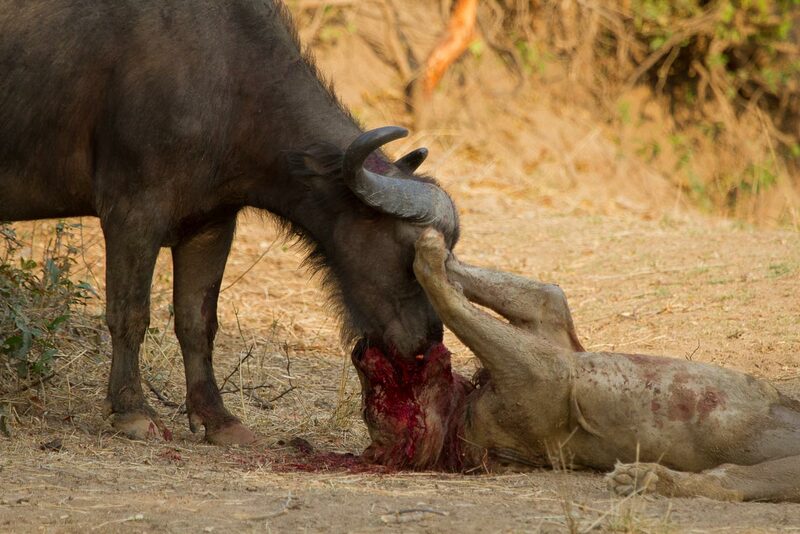 These two male kudus that met their end in a grim battle for dominance in Botswana’s Okavango Delta.